When Should You Get a Second Opinion for Car Maintenance? Most people develop a unique bond with their car. Trips are taken in, sunrises shared with, and names are given to many of these cars. Yet, not all car owners consider getting a second opinion when it’s time for maintenance on their trusty steed. With the options available to the average car owner, they really should. Here’s how to know when to get a second opinion for car maintenance. Maybe you’ve moved away and can no longer take your car to your trusted mechanic. Maybe you have recently purchased a brand that your mechanic does not service. Whatever the reason, you’re needing repairs and not sure about the quote you received. Perhaps it’s time to get a second opinion for car maintenance. If that odd buzzing sound or vibration has led to that dreaded high price tag repair you’ve been dreading, you shouldn’t always take that first recommendation you get from your mechanic. Newer cars are highly complicated pieces of machinery. Depending on the make and model, it’s commonplace for there to be multiple causes for a single issue, leading to confusion. For instance, if one mechanic has recommended a new radiator, it’s worth your while to take it to another mechanic, as the source issue could be as simple as a faulty temperature sensor. Once you have a quote from your mechanic, don’t hesitate to call around to other mechanics. Tell them what you need done and ask how much to expect to pay. This way, you’ll get a much better idea of what to expect to pay. When it’s time to take your car in for that Second Opinion from a mechanic, it’s best to keep in mind that this recommendation isn’t just about pricing. The second opinion may end up the costlier, yet correct one in the end. What it all boils down to is expertise and the general impression you get from these service professionals. You haven’t spent any additional money to gain the added information, and now you’re more equipped to make the decision on what’s needed next for your beloved car. You can ask for a second opinion at a doctor, so why be hesitant to ask for a second opinion about your car’s health? Getting a second opinion isn’t going to hurt anyone’s feelings. It’s all part of the profession. These tips will help you identify how to approach getting a second opinion. Listen to your instinct. If you aren’t getting a good feeling about what you’re hearing, then don’t hesitate; listen to that feeling! There’s a good chance that you have that feeling for a reason. Move on to another mechanic. Be familiar with your vehicle. With all of the resources available on the internet today, all it takes is a quick online search to get some ideas on what the problem might be. If what you’re hearing doesn’t sound right, then don’t hesitate to look for another mechanic. Sound like you know what you are talking about. Much like being familiar with your vehicle, sounding like you are knowledgeable about your car will help prevent you from being taken advantage of. Unfortunately, some mechanics take advantage of customers instead of guiding them to the most economical path. Be straightforward. Establish good boundaries early, and don’t hesitate. Know what you want, and don’t hesitate to take your business elsewhere if you feel like you are being pushed. Don’t hesitate to call other mechanics. Let your fingers do the walking and call around town to find out what other mechanics are charging for the quote you received. And, who knows? They might find that the problem is different than the one you were quoted for. A lot of the customer-mechanic relationship is based on trust. Think of it like going to the doctor. You aren’t going to visit a doctor who keeps pushing medications on you and doesn’t respect your wishes. Likewise, you shouldn’t feel obligated to choose a mechanic who doesn’t respect you or your car. No one is looking forward to the next time they need to take their car into the mechanic for service. That said, when that time does arrive, you can be assured that the team at T3 Atlanta are comprised of award-winning experts who are prepared for any customer’s vehicle problem. From large scale issues to regular maintenance and oil changes, T3 Atlanta offers discounted services 365 days a year for Nissan, Infiniti, Toyota, and Lexus vehicles. With two locations in the Atlanta metro area, T3 has you and your car’s best interest in mind. Common electrical problems in cars are varied. While everyone always thinks of the battery first – and it’s true that the battery is most often the culprit – your electrical system is much bigger than that. In fact, in newer cars, the electrical system is larger and more complex. This introduces more ways for something to go wrong. The reasons for car electrical problems can be many. Your vehicle might have a loose electrical connection. A blown fuse will cause problems. Sometimes, it’s that one part of the system is constantly drawing power, even when the engine is shut off, and it slowly drains the battery. Perhaps the most common cause of car electrical problems is that the battery is failing. Most car batteries only last about five years. Cold weather can also shorten the life of your battery. Many things can indicate you have an electrical problem with your car. Some of the following signs could be caused by other factors, but if you find multiple symptoms it’s usually a pretty solid indication your car has electrical issues. Blown fuses: When you constantly must replace blown fuses, this indicates something in the electrical system is sending too much current through those fuses. Dim headlights/taillights/dome lights: If you notice any of the lights on your car are dim as you’re driving, this can indicate a problem with the electrical system, usually that the alternator is failing. Ignoring it could leave you stranded somewhere. Engine struggles to crank: To start, your engine needs electricity flowing to the spark plugs. Without a strong flow, the engine will struggle to get going, or it might not start at all. Smell of melting plastic: Never ignore this sign, because it can indicate you have wiring that’s heating up so much, it’s melting the insulation around it. If not taken care of, this could result in a car fire, maybe even as you’re driving down the road. Sputtering engine: If the spark plugs aren’t getting enough electrical charge, the fuel won’t combust fully in the cylinders. Sometimes, the issue might be with only one or two spark plugs, causing the engine to run rough or sputter. Lights/horn/radio won’t work: These problems can be caused by something as simple as a blown fuse, which is easy to fix. If you have multiple electrical systems failing, however, it might indicate the alternator or another component needs to be replaced. Many of these common electrical problems in cars are fairly easy to fix. Your local auto supply store will have replacement fuses and spark plugs. For trickier electrical issues, you may need to visit a mechanic to get the problem repaired correctly. If you can’t turn on anything electrical in your car when it’s sitting with the engine off, that means the battery is dead. Your battery may be low if you turn on the headlights with the engine shut down, and they’re dim. Before you jump to the conclusion that the battery is bad, have it tested by a shop. It could be that the battery is fine, but the alternator is going out. It’s also possible that something is constantly drawing power as the car is sitting, draining the battery. Pop the hood and inspect the battery. If the terminals have any white gunk or other debris on them, clean them thoroughly with a wire brush. Corrosion can bring your car’s electrical system to its knees. If that isn’t the cause, wiggle the battery cables to see if they’re loose. While you have the hood up, inspect the alternator belt. If it’s loose, or you see signs of cracking or fraying, have it replaced immediately. A bad belt can make even the best of alternators run poorly. Another easy potential cause to diagnose is the spark plugs and wires. Check that the wires are seated firmly at both ends. Using an extension on your socket wrench, ensure the spark plugs are also tightened all the way. When you experience electrical problems while driving, like your headlights dimming, that’s usually a sign the alternator is going out. Ultimately, diagnosing a vehicle’s electrical problems can be pretty complex. There comes a point when you need specialized equipment and training to be accurate in your diagnosis, which is where a quality repair shop such as T3 Atlanta comes in handy. We can pinpoint where a loose connection, unusual power draw or other issues are causing trouble, and fix the problem for you. You rely on your brakes each day. Despite this fact, most people rarely think about their brakes until there’s a problem. Unfortunately, a problem with your brakes can have major consequences. Car brake replacement is a serious subject. Knowing when your brakes need to be replaced is a great way to avoid problems. The only thing is, you might not know or recognize the early signs. If your brakes become too warn, they might do enough damage to make it a costly repair and maybe even require professional servicing. Squealing: If your brakes make a high-pitch squeal each time you press on the pedal, that’s usually a sign the pads are too far worn. The sound is made by a metal shim or indicator that’s designed to get your attention. Sometimes, though, if your car has been sitting where it’s exposed to water, the brake discs develop a thin layer of rust. This generates a squealing sound, but it is temporary and won’t keep up for long. Grinding: When you hear a grinding sound as you step on the brake pedal, not a squeal, that almost definitely means your brake pads are worn to nothing. As the caliper, which holds the pads, scrapes against the discs, the metallic grinding is produced. If you don’t address this problem right away, irreparable damage to the rotors is imminent. Vibration or Fluttering: As you push on the brake pedal, you might feel a vibration or slight flutter. During hard braking situations, like if a car pulls in front of you, this could be the ABS system pumping the brakes for you. This is different, because you feel it all the time, even when casually slowing to stop. Over time it grows. Usually, this is an indication the discs are warped, usually from riding the brakes as you go down steep hills repeatedly. Sometimes the rotors can be resurfaced and saved, otherwise they must be replaced. Pulling: As you brake, you might notice the car consistently pulls left of right. This is a sign the pads have worn unevenly, or that something foreign got into the brake fluid. Obviously, not only can this be annoying, it’s dangerous. Diminished Power: If you notice your brakes don’t stop as well as before, or that the brake pedal just sinks to the floor of your car, that one of the signs of old car brakes. This problem usually means you have a bigger problem than worn brake pads. Likely, it’s a sign that the brake lines are leaking, or at least that you need to top off the brake fluid reservoir. If you also notice an oil-like substance pooled wherever you park the car, a leak is likely. If you notice one or more of these issues when you step on the brakes, car brake replacement may be necessary. At the very least, you may want to consider a visit to your mechanic to make sure there isn’t another underlying problem. If you’re mechanically inclined, you can swap out brake pads with relative ease. Car brake replacement requires some specialized tools and supplies before beginning. If you don’t have these supplies on hand, many tool rental shops have them. First, you want to loosen the lug nuts before raising each wheel and supporting that corner of the car with the jack stands. Loosen the bolt on one end that hold the caliper in place, then pivot the caliper to access the brake pad, which you pull out. If you’re having trouble loosening the bolts, use the wire brush to remove surface rust, or apply penetrating grease to the threads, being careful to not spray the brake disc. Compress the pistons on the calipers with the C-clamp so they’ll clear the new, thicker brake pad. Insert the new pads into the calipers, then reassemble everything by reversing the order you followed to take it all apart. Not everyone is comfortable with servicing their own brakes, or you might not have the time. As always, T3 Atlanta is here to help. Our technicians have the training and expertise to ensure your brakes are properly cared for, so when you need them most they’ll operate properly. Plenty of people wonder about airbag maintenance, or maybe even worry about it. After all, you regularly service other parts of your car, so why not the airbags? They are one of the most critical safety items, so having them not work properly in a crash could have serious consequences. At the same time, airbags haven’t been around as long as seat belts, so knowledge about maintaining them isn’t as widespread. To understand why airbag maintenance is necessary, you need to have at least a basic understanding of how they work. Your car has sensors embedded in different areas, like the bumpers, which are connected to the airbag inflator with wiring. When enough force is exerted against those sensors, a signal tells the inflator to do its job. In most setups, potassium nitrate mixes with sodium azide, which makes nitrogen gas. That sudden creation of nitrogen gas fills the airbag. Airbags are made of a thin nylon fabric. It’s folded up compactly, with a cover designed to tear when the bag inflates. This is why airbags pop out so quickly. Do Airbags Need to Be Replaced? The answer to this question is that it depends. Some owner’s manuals suggest that they do after a certain period of time. Others don’t say, and still others mention getting the airbags inspected. Read the manual that came with your car to see what the manufacturer recommends. Just remember that when manuals for older cars were written, airbags were pretty new and manufacturers themselves weren’t too sure about how they would age. Some airbags will last as long as the car they are in. Airbag maintenance is sufficient for some, while others may need to be replaced entirely. If your car is over ten years old, it might be a good idea to have the airbags checked out. The worst way to find out is for a crash to inform you of how everything works. Airbags are something you don’t really want to take a chance on because they may save your life. If you are concerned, it’s best to err on the side of caution and get an inspection. Have a professional inspect your airbags and give you a recommendation about what to do. The worst thing you can do is wait and see. Most vehicles have a diagnostic system for the airbags. If you see an SRS light come on, that means the airbag system is experiencing trouble and airbag maintenance may be required. You should have it inspected professionally right away, because the consequences of not following through could be severe. Always use a reputable shop to have airbags serviced, especially if you need replacement bags. Some unscrupulous businesses have used knock-off airbags that have come into the country illegally. 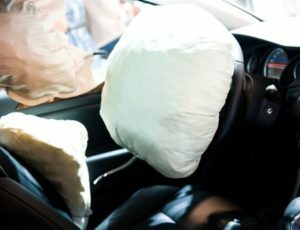 Even though they look legit, these airbags can be downright deadly, so any cost savings comes at a steep price. Repacking airbags is also dangerous and not legitimate. No good shop will engage in this practice, because the potential for getting the setup wrong is too high. If you get a vehicle with funny bulges in the airbag areas, that’s usually a sign of a repacked airbag. How much replacement airbags cost really depends on the make, model and year of your vehicle. They can be quite expensive, but that’s not necessarily the case. Even if an airbag costs a considerable amount, it’s a good idea to stick with Original Equipment Manufacturer (OEM) bags, instead of aftermarket options. Buying OEM parts may drive the price up, but at the same time you will not need to worry about the quality. Since a quality airbag could literally mean the difference between a minor injury or loss of life, it’s better to invest in your safety. If you’re in need of a quality shop that has extensive experience with inspecting, maintaining and even replacing airbags, give T3 Atlanta a try. We only use reputable practices and parts, ensuring your airbag system works just as it was designed, so you can rest easy knowing if you ever need the airbags to work, they’ll do their job properly. Most people just don’t think about their car’s heater until they’re in need of auto heating repair. After all, you basically flip a switch and hot air comes out of the vents. It’s a great feature everyone takes for granted, which is why having problems with it can be infuriating – especially during the winter! The good news is you can turn to car heater repair shops and have the problem fixed. Depending on what’s wrong, you might be on your way in a short while. Trying to repair the heater yourself, unless it’s an incredibly basic problem, isn’t advisable. The level of difficult for those kinds of repairs is well beyond the mechanical skills or expendable time on most people’s hands. How do Car Heaters Work? The hot air you feel blowing through the air vents originates in something called the heater core. It’s basically like a small radiator embedded under the dash. Hot coolant is transported from the engine to the heater core, where a fan helps extract some of the heat, blowing it into the cabin. This is why people say if your engine is overheating, you should roll down the windows and turn the heater all the way to full blast. When you first get into your car on a cold winter morning, the air coming out of the vents isn’t hot. This is because there literally is no coolant running to the heater core. As you drive, the engine heats up, which increases the coolant’s temperature to the point it’s ready to be sent to the heater core. As it does, the air coming through the vents heats up as well. Do Heaters do Anything Besides Heat? Your car’s heater system also affects the defroster. Vents aimed at the windshield (and on some models the back window) blow hot air directly onto the glass. Their purpose is to remove any fog, snow, or ice buildup. Without the defroster, you might have a hard time seeing, especially at night. Since the defroster is also dependent on the heater core working properly, you should get any heater system issues fixed immediately. Losing the defroster because of a problem with the heater system can actually cause a wreck, putting you and fellow drivers in serious danger. Because the heater works by using coolant that’s been heated up by the engine, a coolant level that’s too low can cause serious issues. Sometimes, fixing the problem might simply require topping off the coolant to a normal operating level. You need to be careful about doing this yourself. Opening up the radiator or pressurized overflow reservoirs when the car is even a little hot can be catastrophic. The coolant can be incredibly hot, spewing out and burning you. Always heed any warnings printed on the cap of whatever you intend to open. If you’re not sure what you’re doing, it’s best to not risk serious injury and call a professional for auto heating repair. Other problems could have to do with the heater core, or the hoses that transport coolant to and from the car’s coolant system. Replacing old, cracked hoses should only be done when the engine is cold. There’s a slight chance the fuse your car’s heater runs on could be blown. Checking the fuse is a quick and easy solution for auto heating repair, as is replacing it, if needed. You might be considering a plug-in heater for your car instead of repairing problems with the built-in heater. One factor to consider is that plug-in heater can put an extra drain on your car’s battery during the time of the year when cold weather puts a strain on them. You’ll also need to find a spot to place the plug-in heater, which can be tricky depending on the car’s interior layout. Just as important is the fact that the hot air from this type of heater might not reach the backseat quickly, especially if your car has rear air vents, making trips uncomfortable for your backseat passengers. Most importantly, plug-in heaters don’t defrost windows, so you could still suffer from serious visibility issues. If you’re in need of auto heating repair in the Atlanta area, come by T3 Atlanta today and we’ll gladly take a look at your car’s heater. Our highly trained technicians know how to pinpoint problems and repair problems quickly, so you’ll be on your way quickly. Maybe you’ve heard people talking about transmissions before, but are too afraid to ask: what is a car transmission? That’s understandable because you don’t want to seem ignorant, be made fun of, and so on. Instead or continuing to live with this fear, read on to find out not only what transmissions are, but how they work. This information will enrich your life. First, it will make you more aware of how your car’s transmission works and how you can care for it better. Also, if you have problems with the transmission later, you’ll have a better idea of what’s going on. When you go shopping for a new car, knowing what a transmission is and how it works will help you make a better decision on which vehicle to buy, depending partly on the included transmission. First off, you should know the transmission connects to the engine through the torque converter. It transfers the energy generated to the engine through the transmission’s gears. That energy is then sent to either two or all four wheels, which makes the vehicle move forward. The torque converter takes the place of a clutch, and it works using hydraulic pressure. More specifically, there’s an impeller which is the first part to receive energy from the engine. A clutch is between that and the turbine, which works with the gearbox input shaft. Hydraulic force transfers the torque from one part to the next. Inside the transmission are planetary gears. The gears are sized differently, like the ones on a bicycle, with the smaller or lower gears making it possible to get going. The larger or higher gears require less effort to keep the car moving forward, conserving fuel. A computer decides when the gears should be changed and in which direction. Driver input with the accelerator pedal and other information might go into this process. Automatic transmissions often run into problems with gear changes, which can actually make transmission repair for qualified shops a little easier to manage. One of the most common is when it makes a clunking, whining or humming sound at different times. This can be caused by a variety of transmission issues which a technician can then diagnose and repair. Hesitation is another common automatic transmission problem. When you shift from park to drive or reverse, there’s a delay before the car’s ready to move. Usually, this means there’s a problem with the torque converter or clutch assembly. It’s possible an even deeper problem exists, although that’s not as likely. Your transmission might also grind or shake, which is signaling there’s a problem. This could be accompanied by the feeling of a clunk or knock when the transmission shifts from one gear to the next. Your transmission has been designed to run smoothly, so a problem like this shouldn’t be ignored. Possible explanations for this problem can often include worn gears, although low transmission fluid and even a leak could be the culprit. Again, a qualified technician can usually pinpoint the cause of such a problem quickly, working on a solution and possibly saving the transmission before a full replacement is necessary. Believe it or not, another common problem with transmissions is when the check engine light comes on. The light on your dash might look like an engine or it could simply say “check engine.” Despite the name, this light doesn’t necessarily mean there’s a problem with the car’s engine. There are sensors in critical parts of your car which can measure early on if there’s a problem. Depending on the make and model of your vehicle, you could have one or more that monitor the transmission’s operation specifically. Once they detect an issue, the dash light is triggered. Certified technicians can read the error code for your car and know immediately why the light is on, then take appropriate action to fix the situation. Of course, there are a number of other things that can go wrong with an automatic transmission. No matter what problems you’re experiencing, know that T3 Atlanta is your transmission repair specialist. Our technicians are trained on the latest techniques to diagnose and fix your transmission, so you can get back to your busy life. When your car is leaking oil, it’s almost like the machine is bleeding. Oil isn’t too dissimilar to blood. Lose enough, and the engine can be severely damaged. Being careless about the oil can end up costing you thousands of dollars in damages, maybe even making a completely new engine necessary. Oil leaks are caused oftentimes by worn engine gaskets or seals. Depending on the design of your engine, it could also be from an oil line, which transports the liquid from one component to another. The repair involves replacing the defective seal, gasket or line. Sometimes, a leak can signal a bigger problem. The big question you always need to be asking is how to tell if you have an oil leak or not. In all honesty, some cars (especially older ones) might burn some oil. Because of that fact, you can’t just judge based on the oil level. But you should be checking the oil at least once a month, if not sooner. On vehicles with a lot of miles, checking the oil every time you fill up the fuel tank is ideal. You have an engine oil leak if you find brown, greasy liquid anywhere you’ve parked it. Even a small leak can be a big deal because it could quickly turn into a much larger one. Depending on the design of your engine, it could drop the oil level just low enough to cause problems with certain components. If your vehicle has a turbocharger, the leak could be from the oil line running to the turbo itself, and a small dribble of oil leaking out might cause serious damage to the turbocharger. In other words, ignoring any size oil leak is a bad idea. There are a number of additives you can put into your car’s oil to repair leaks. You need to be extremely careful of such products, though, because they could have serious negative effects on your vehicle’s performance. Even if the additive doesn’t hurt your engine, it may not repair the leak. Finding an oil leak can be tricky. Just because the oil likes to pool at one point under the car doesn’t mean the oil is coming out at a spot directly above. It’s entirely possible the oil could be hitting other components such as tie rods, running along them for a while, then falling to the ground. This means you have to do some investigative work to figure out the exact location of the leak. Following the trail of motor oil can lead you to the right spot, unless the oil is hitting a hot component like the exhaust manifold and splashing everywhere. Sometimes, you may think your car is leaking oil but the problem is actually caused by oil filters that aren’t screwed on all the way. If you change your own oil, always apply some oil to the seal on the filter around the opening, and tighten it as much as possible by hand. If the filter is the source of a leak, you’ll see it’s soaked with oil just by climbing under the car. This is an easy fix. There’s also the off chance that damage to the oil pan could be the source of a leak. If there’s severe damage, so much oil would be running out you’d probably see the oil pressure warning light before noticing a puddle under the car. A pinhole leak from corrosion, rock damage, etc. might be enough to only leave a small amount of oil under the vehicle. If this is the source, you’ll need to get a new oil pan and swap it out with the old one, which is a pretty straightforward process. Once you’ve pinpointed the source of an engine oil leak, you can take steps to replace the faulty part that’s the source. Exactly how you go about this really depends on the component, your mechanical skills/experience and what vehicle you drive. Many oil lines are fairly easy to replace, but some can be tricky. Most gaskets and seals require some advanced skills to replace, because you’ll need to open up part of the engine and replace everything according to the manufacturer’s specifications, including the amount of torque applied to each bolt. If your car is leaking oil, it’s important to find and repair the leak as soon as possible to prevent severe long-term damage. In some cases, however, finding or repairing an engine oil leak is too difficult. If you find yourself in that position, it’s time to hand the car off to a professional. At T3 Atlanta, our technicians have sophisticated training and specialized methods for tracking down and fixing oil leaks. You’ll love the way you’re treated so much, you’ll actually look forward to coming back. Keeping up with vehicle maintenance is actually a great way to prevent big problems down the road. Back in the day, you had to keep a log in the owner’s manual or use a separate piece of paper, and hope you didn’t forget when you were supposed to do what. Fortunately, today we can manage things much easier with car maintenance apps. You likely keep your phone, tablet, or other mobile device nearby most of the time. By installing one of these apps, there literally will be no excuse for not taking better care of your car. The old-school paper service logs were hard to use, mostly because you inevitably forgot to enter different items. With your phone or tablet pushing out alerts on a regular basis, it’s basically impossible to forget taking care of your vehicle. Each of the car maintenance apps listed below is available for both Apple iOS and Android, which covers virtually all of the smartphones in existence today. That means there’s no feeling like you need to buy a new device just to take better care of your ride. Check out the MyCarFax app. It can help you track the maintenance needs of up to five vehicles at a time, which is great for households with multiple drivers. Adding a vehicle can be done by entering the VIN or license plate number. If you prefer an easier method, you can also scan the bar code next to the VIN. This app tracks not only upcoming maintenance items needed such as tire rotations and oil changes, but also open recalls. When you take your vehicle to a service shop, the maintenance log is updated automatically, so there’s no having to type in all of the information manually. The big advantage of this app is that it draws on the 12 billion records available through the CarFax database. Another unique aspect is that it can recommend local service shops, showing user ratings, so if you’re in an unfamiliar region you can make a more educated decision. Also available for Android and Apple users is AutoCare. Although it’s not free, the app can help you manage multiple vehicles with customizable service reminders, making it a useful auto maintenance app. The ability to customize alerts is actually a truly great feature, because say if you use synthetic oil and can stretch out oil changes further, the app will accommodate that instead of bugging you to change the oil too early. For the financially-minded, AutoSprite is an ideal car maintenance app. Like other options, it helps track when your vehicles need servicing and exactly what kind, providing easy-to-read reminders. You can use the app to even book an appointment at a compatible service center. Where this option really shines is that it allows you to see a list of expenses you’ve paid during a defined period of time for vehicle maintenance, making it easier to track trends. It also can help with shopping for good insurance rates, something you can do periodically to save money. Not only can you track vehicle maintenance records and needs with RepairPal, you can also be better prepared to fix your car. Everyone knows that accidents and unexpected thing happen in life, but this app helps you take it in stride with a one-touch option for roadside assistance. You can also use it to locate a quality local mechanic, plus it provides fair pricing for different jobs so you don’t end up paying too much. In case you aren’t aware, every vehicle comes with a maintenance schedule. It’s created by the manufacturer and shows when certain items need to be checked and possibly fixed. The schedule can include items such as changing the oil, swapping out an air filter, or inspecting shock boots. Vehicle manufacturers set specific times that the various items should be check over. While it might seem like a simple thing, keeping the maintenance schedule on a car actually provides a huge benefit. Automakers know the vehicles they designed and built incredibly well. When it’s time to address the various items on the schedule at the designated times, come to T3 Atlanta. You can avoid maintenance problems down the road, saving money and grief with big repairs.